Ann is a graduate of Albion College with a Bachelor of Science Degree and a business minor. Ann joined the staff at Animal Cancer and Imaging Center in 2000. Her Golden Retriever "Popeye" first introduced her to Dr. Obradovich. Popeye had a mast cell tumor in his abdomen and went through a full course of radiation therapy and the cancer was ultimately cured. Popeye lived to the happy old age of 16! Ann and her husband, enjoy golf and sharing time with family and friends. 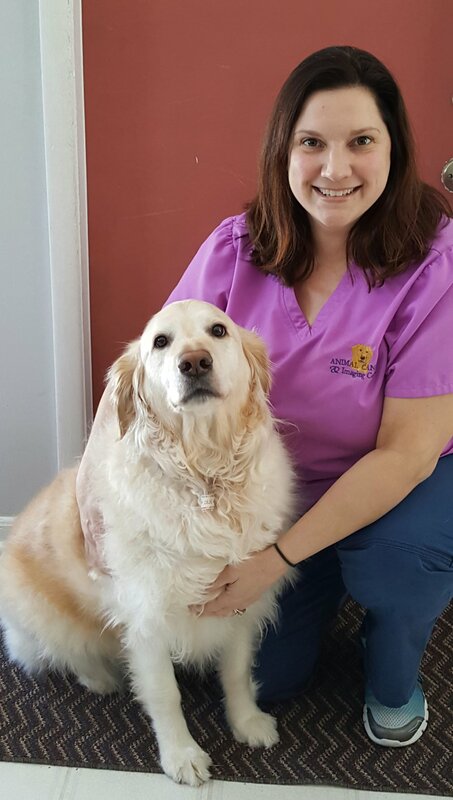 Ann's favorite perk of the job is meeting and greeting our patients and sending them home with treats. She is affectionately known as the treat ambassador and our patients can't wait to see her! Sarah came to us in 2010 as a receptionist, with previous veterinary experience at a general practice. Sarah was a stay at home mom to her two boys and now has chosen to come back into the workforce and do what she loves, be with animals and work with people. Sarah was also a client with her bullmastiff, Buddah, who lived 9 wonderful years! She currently has 2 mastiffs (Elly and Gracie-pictured above) and a also a cat (Max). When Sarah is not working, she is living at the hockey rinks watching her husband coach her 2 boys (Joseph and Nathan) playing hockey. Susan graduated from Eastern Michigan University in 2000 with a degree in Apparel and Textile Merchandising. She has been with ACIC since 2013, as a receptionist. This is her first experience with veterinary medicine, and we think she has made a wonderful transition. Prior to having children, Susan worked in customer relations. When not answering phones and manning the front desk, she enjoys taking in her children's sporting events and cooking, and trying to keep up with her young Golden Retriever. Karen had worked with Dr Obradovich way back in the 90s, and joined the ACIC team again in 2012 as a receptionist after being a stay-at-home mom. When not manning our front desk and helping clients, Karen spends time watching her children play sports year around, and enjoying her family! She is married with 2 teenage boys, and a dog (Lola) and cat (Barry). Mark comes to us with more than 20 years of business administration experience. Originally from Connecticut, Mark attended Graham Junior College in Boston, then New Haven University. He moved to Maui, Hawaii in 1977 and owned and operated an ocean recreation company known as "Sea Sails" until 1996 when he moved to Michigan. Mark is our facilities manager and general 'fix-it' guy. He lives in Howell with his 2 dogs, 2 cats, 6 parrots and his wife (Dr. Obradovich). In his spare time he sails competitively.